When coal was discovered in Osage County around 1860 it influenced the development and route of the Atchison, Topeka, and Santa Fe railroad. Mining coal greatly stimulated the growth and development of the county. By 1871, the coalfields of Osage County became the leading center for coal mined and men employed west of the Mississippi river. Osage City was surveyed and platted late in the year 1869, after the route of the Atchison, Topeka & Santa Fe Railroad had been fixed, but before it had been built to that point. 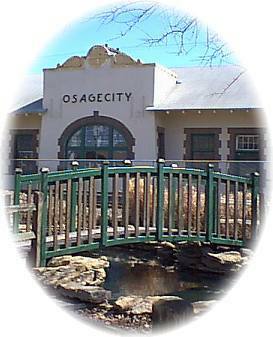 With the job potential of the mines and the access of the railroads, Osage City quickly developed into the largest city in the county. Osage City has an architecturally varied mixture of modern and historic frame and brick buildings, including old street lights that still dress the beautiful residential area along south Sixth Street. The downtown businesses are primarily family owned, giving a homey environment to the entire business district. Two old-fastioned soda fountains are still part of downtown. Osage City has abundant access to recreational areas as it lies within 15 miles of two state lakes Pomona Reservoir and Melvern Reservoir that provide boating, skiing, and camping areas. Besides scheduled recreation programs, Osage City allows for other recreational opportunities through skydiving, a city golf course with a fishing lake. The city of Osage City is home to approximately 3,000 residents and its proximity to the larger metro areas of Topeka and Kansas City makes Osage City an ideal place to visit, rest, and raise a family. One of the identifying icons of the 20th century is surely the gas pump. There are a million of them across the country and we use them without much thought to their evolution. However, gas pumps and gas station memorabilia are treasured by thousands of collectors.